Although our travels are well behind now, the work has continued at our home institute, the Swedish University of Agricultural Sciences in Uppsala. Most larvae are now in their final instar and will pupate within a week or have already pupated if they are not parasitized or virus diseased. So far we have seen quite a few cases of virus disease in our rearing, particularly from Gratangen (Norway, location C in the map in the previous blog), where the densities were quite high this year. The work with the larvae dead of virus continues in the laboratory by our colleagues, who will look for DNA and RNA viruses with genetic methods. The investigation will hopefully further our mission of revealing the role and abundance of viruses in the mountain birch – geometrid system. 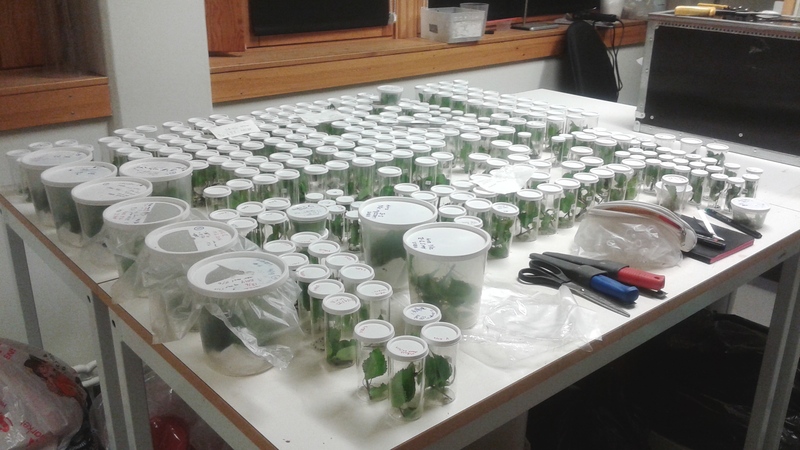 On our trips we have taken samples from geometrid populations from 6 locations in northern Fennoscandia. These areas have in general been long studied for the cyclic dynamics and outbreaks the moth species exhibit by research groups in Sweden, Finland and Norway (see for example here and here) The populations we selected for our sampling are in different phases of their population cycles and outbreak cycles. The different locations also represent forests of different age structures and successional stages. 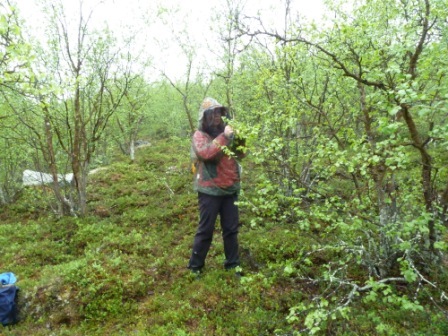 The larval densities at Abisko and Kilpisjärvi reached very high levels in 2013 and large areas of mountain birch forests were defoliated. Repeated outbreaks and successive years of defoliation will inevitably affect the whole forest more or less. Dieback of shoots, branches and older tree stems are direct results of the defoliation and tree death due to secondary factors as fungi and wood boring beetles may also occur. Tea posing with vials. Sometimes during low densities a researcher can be happy and lucky to find just a few larvae. 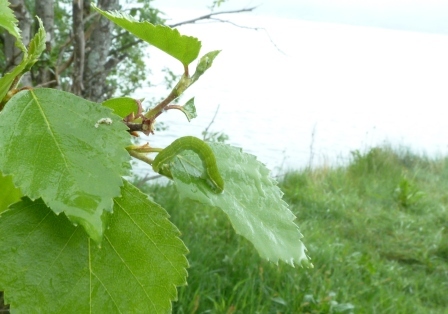 Operophtera larvae on birch shoots in Nuorgam. 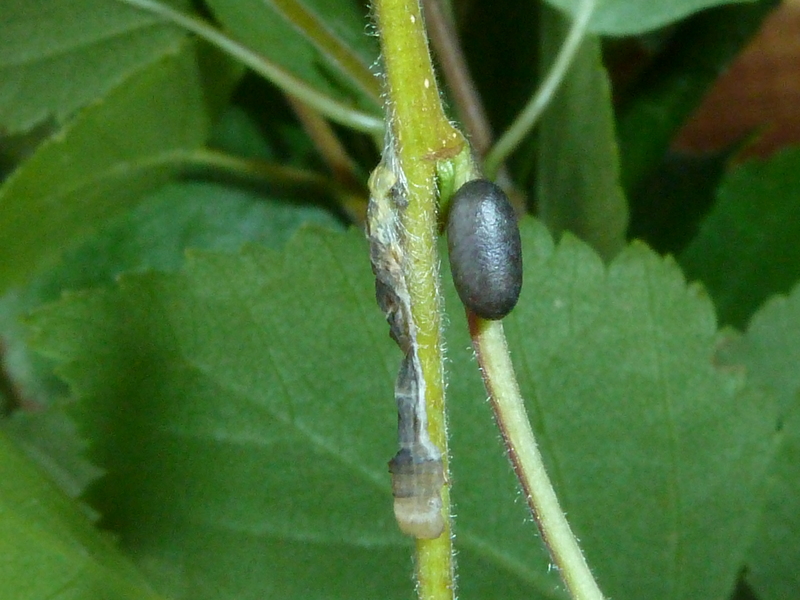 At high densities one may find several larvae crowded on one leaf. Phenology and especially matching the host tree phenology in the spring is an important factor defining the success of the winter and autumnal moths. This year leaf advancement in relation to larval developmental rate was fairly variable at Abisko and at Kilpisjärvi sites had early instar larvae and newly flushed leaves at the time of our sampling, marking a fairly good match. On the other hand, the birch leaves at Gratangen, Nuorgam and Neiden sites were well advanced while larvae were fairly early. The fluctuation in spring temperatures is a significant signal for the birch leaf bud burst in the spring. It seems that a period of cold weather has probably slowed down the larval development rate maybe more than the rate of leaf development in Gratangen, Nuorgam and Neiden. 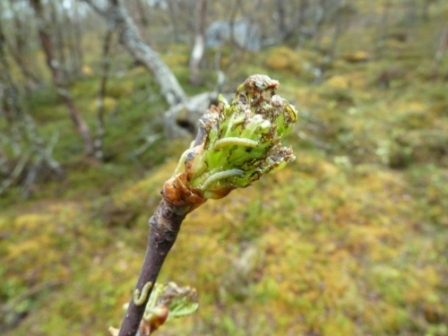 The larval densities in the previous year, and hence the stress on the birch, may also affect the budburst and the following phenology match. More on that hopefully later, as our observations inspired further investigations! Epirrita autumnata larvae trying to scrape of some food from mountain birch leaves. These leaves have been early in their budburst and have already become a little too tough for the larvae. 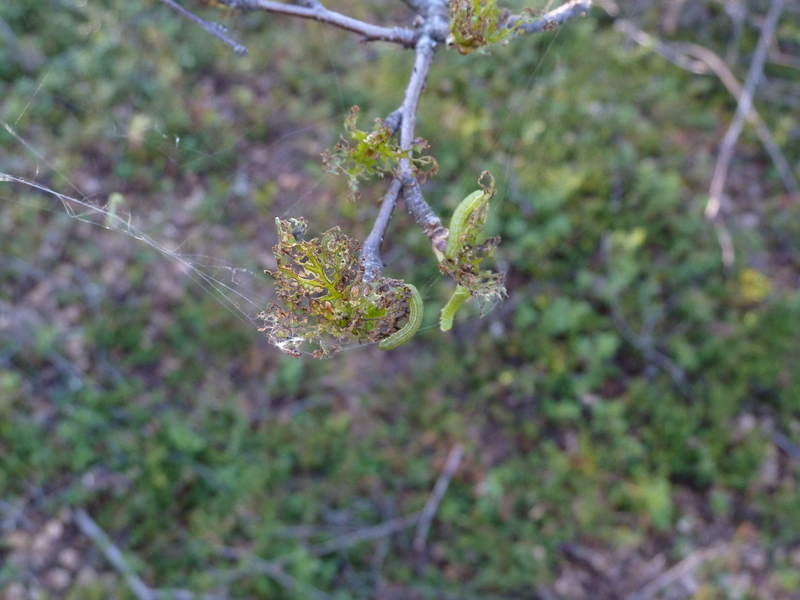 Epirrita autumnata larvae at Kilpisjärvi encountered birch leaves that had just had their budburst. Above you can see examples of the parasitoids in our system. First from the top: Many Copidosoma chaconotum pupae filling up an Epirrita larva almost to a bursting point. Second from the top: A free flying parasitoid (a braconid) female searching the mountain birch leaves for hosts. Third from the top: gregarious ektoparasitoid larvae of Eulophus larvarum feeding on a still living Epirrita autumnata. Fourth from the top: A solitary endoparasitoid (Cotesia sp. or Protapanteles sp.) has come out of its host and formed its own pupa next to the host carcass. Lowest: An Ichneumonid parasitoid (Phobocampe sp. )has thoroughly consumed its host and left behind an empty skin to form its own black cocoon next to it. All photos by Helena Bylund. Dead tree stems and grass in Nuorgam. The whole ecosystem is affected by the geometrid outbreaks. The large fluctuations in geometrid densities are affecting other organisms at all trophic levels from soil dwelling microorganisms, plants, other herbivorous and predatory insects and invertebrates as well as birds and mammals. Defoliating outbreaks relocate nutrients and affect the forest structure, light conditions and composition of fungi, herbs, and grasses at the forest floor for years. The changes in plant species composition affect herbivores and predators of all kinds during the following years: more grass for grazing animals and seed feeders and so on. During years with high larval densities many birds are successfully reproducing with high survival of fledglings due to abundant food resources. However, the higher abundance does usually not persist the following year since winter survival is low. An early bird catches a worm, or two! 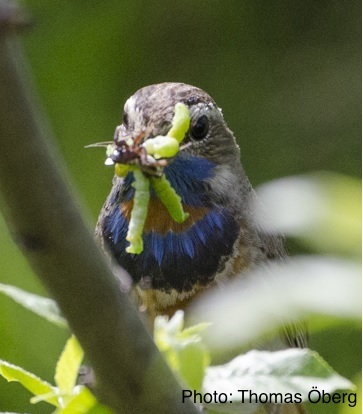 A Bluethroat (Luscinia svecica) with its beak full of autumnal moth larvae. Collecting our samples from three countries at 5 locations requires a bit of travelling endurance. 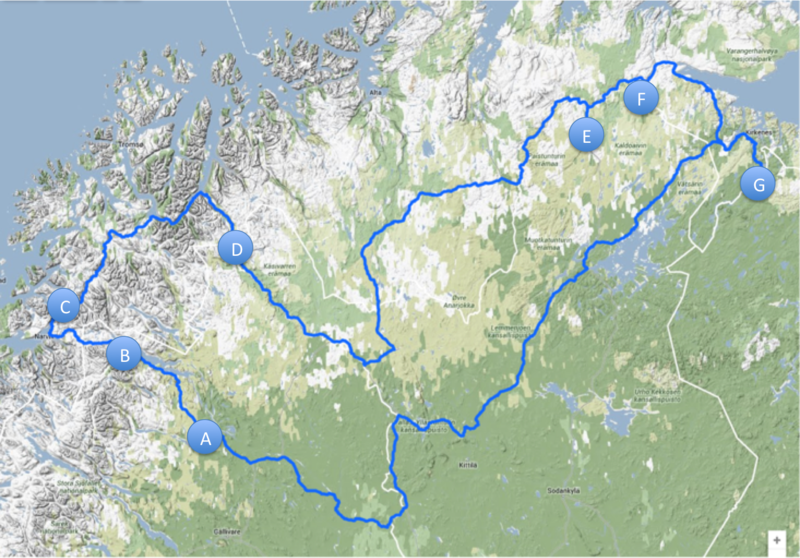 Altogether we cover about 1960 km in northern Fennoscandia in our rental car and cross the national borders 7 times. Sometimes we drive through the customs three times in one day. Luckily the borders between the three northern countries are fairly open, and a small car like ours rarely has to stop at the border. This makes our travelling quite smooth and we usually cover the whole trip in about 10 days. Figure below shows our route for VINCERO. Start point at Kiruna airport (A), where the trip continues through Abisko (B), Gratangen (C), Kilpisjärvi (D), Kevo (E) and Nuorgam (F) to Svanhovd (G) and back. As in the lyrics by Steppenwolf, our travelling is sometimes a bit of an adventure and we see a variety of landscapes and drive in changing conditions. This has been especially true this year, when for the first time, we were caught by surprise by snowfall. The snow took turns with hail showers and sunshine on our drive from Kilpisjärvi (Figure 1, D) to Kevo (Figure 1, E) and made our lunch stop for the day more interesting than usual (Figures below, with Helena). Later we heard that the temperature at Kilpisjärvi had dropped to -5°C the night after our departure. We have now returned from our trip for the summer and the last leg of our travels is in a plane back to the south. For this we checked in an extra box in the animal compartment as pets (neither cat nor dog) containing approximately 400 caterpillars of autumnal and winter moths. Thanks to the staff at Kiruna airport, we have never had troubles packing our larvae with us! …Stands for Air Conditioning and Daily Cleaning that are the most important issues we think about every day. Firstly, air conditioning is a feature we require of our rental car, although the summers in northern Fennoscandia are not in general known for high temperatures. This is because the sun shining on our larvae directly in the back of the car can raise the temperatures in the vials to sweaty temperatures for our pets. As mentioned before, this year heat was not the problem, but we did loose some individuals one year due to an unexpected heat wave in the north. A few rather ordinary pieces of equipment are required for our daily caretaking. A good knife is of course always a good tool, but usually we carry with us something sturdier, namely branch scissors! At their later instars, the larvae may eat up to three whole birch leaves a day, so we need to make sure to be prepared for cutting lots of short shoots from mountain birch branches and feeding them. Sometimes the feeding is done at our friendly relatives’ back porch, but this is where the research stations are a valuable asset on our travels providing laboratory and other facilities to take care of our collected specimens. Rearing continues at our department. Particularly this year with our virus infected studies the roles of tweezers and hand disinfectant have been elevated. It is not certain how the virus spreads from one larva to another, but suspicions about it being present on the leaves or in the soil with the pupae have risen. We hope that individual rearing and diligent cleaning of our hands and equipment will reduce the risk of unwanted infections to minimum. Next some more info on our pets and their enemies! P.s. The musical theme for this blog was inspired by a sudden Christmas carol fever Tea got at Kilpisjärvi with the snow fall, that also compelled her to buy Helena a CD full of Finnish Christmas carols for present! The CD was also playing on our way to Kevo. 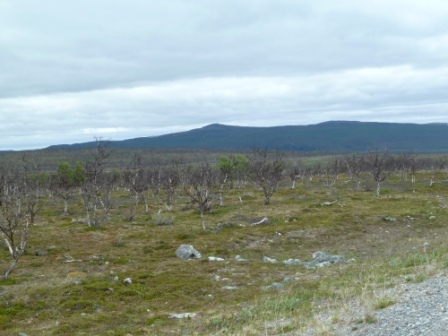 The last two years were hard on the mountain birches especially at Abisko (Sweden) and Kilpisjärvi (Finland) due to defoliation by Epirrita autumnata and Operophtera brumata. Densities of the two geometrids were extremely high in 2013 marking the peak of their 9-10-year cyclic fluctuations. High densities made our sampling under CAPISCO easy, but many of our samples died of a suspected virus disease. This led us collaborating with virus experts at our institute (O. Terenius & J. De Miranda, Swedish University of Agricultura Sciences), who confirmed our suspicions of a virus causing the loss of our larvae. The virus(es) seem to occur especially at high density populations, but its/their role in the cyclic population dynamics is not known. Therefore, we took up the challenge of revealing the link between virus and cyclicity and hope to win (vincere – vincero)! And what about this year? This year, we will again sample our sites at Abisko (Sweden), Gratangen (Norway), Kilpisjärvi (Finland), Kevo (Finland), Nuorgam (Finland) and Neiden (Svanhovd, Norway). 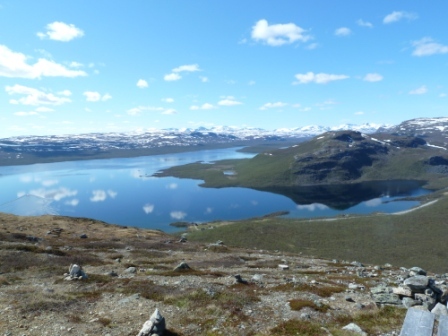 We started our trip on June 12th from Abisko, and it seems that densities there and at Kilpisjärvi are in decline, although still fairly high. We hoped to get a lot of material for the virus experts, and indeed, already now, some of our larvae from Abisko have died of suspected virus disease. Being back on the road, we will sample from a wide range of population densities, and hope to see where and when virus occurs. In addition, we shall report you on what it feels like to cross the borders and time zones numerous times (can’t keep track how many…) and drive in various conditions. We drove in total about 1000 km, of which 674 km yesterday. We crossed the border between Finland and Norway in total 4 times, of which 3 yesterday, and drove along the Norwegian-Russian border for a while. We have counted 107 Epirrita and Operophtera adults flying in front of our car, and yesterday evening saw many sitting outside on the Kilpisjärvi station walls. Luckily not all the time has gone by sitting in the car. 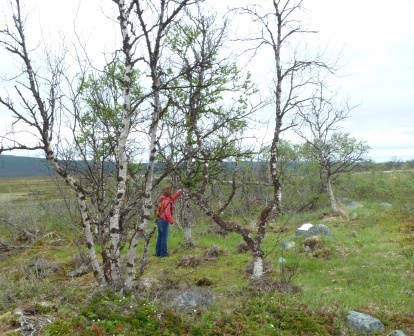 On our second day at the Kevo station, we sampled our transect in Nuorgam. During the summer, we found quite many Operophtera– larvae feeding on whatever was green on the trees in Nuorgam, that have suffered from defoliation of the same species already for a couple of years. Despite the weather being on our side with mild warm breeze and not too much rain, we only saw one or two Operophtera– males flying. However, on our way back to the station, we counted 100 Operophtera and Epirrita– adults flying in front of our car headlights despite heavy rain! 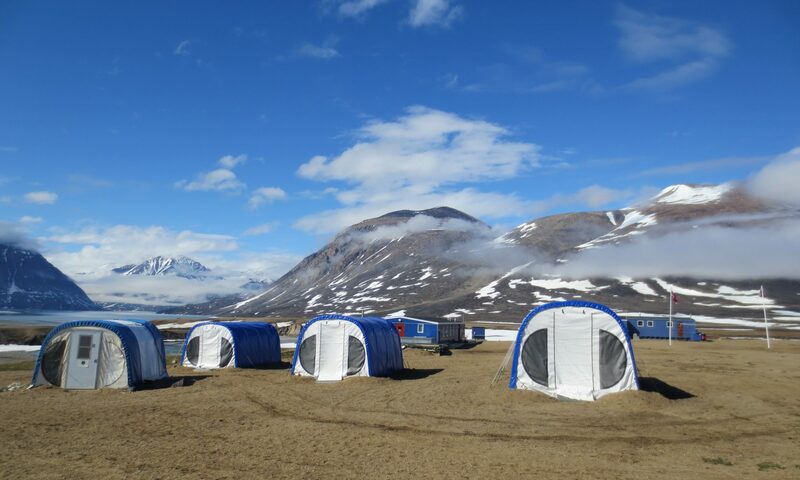 The next morning it was time to leave the Kevo station and head towards our sampling site in Neiden and BioForsk research station in Svanhovd. We both remembered our last time in Neiden when it was only +3 degrees Celsius, rain and wind from the north, and were just hoping for a slightly better weather this time. At first it didn’t look promising, with variable amounts of rain falling from the sky, but as if by miracle, the sky cleared up just when we were approaching our sampling transect. The good feeling got even better then when we saw one Operophtera flying on our way up. In total, our catch from this site was 7 and we even had more time now to appreciate the magnificent view over Federsmyra without freezing to death! In the evening we got to enjoy the good food and hospitality of Svanhovd station. After a good night’s sleep, it was time for a long drive from the east coast of Norway to the western boarder of Finland. The weather was, again, on our side when the light rain ceased around noon and the roads were in good condition. The sun was even shining brightly in the evening, and when arriving to Kilpisjärvi, the setting sun coloured the fjäll Saana flaming red. It was magnificent. We got our energy reserves filled up with tasty dinner at the station and finished the evening with an Epirrita photo session. You could find suitable photo targets almost anywhere you looked, they were so many. CAPISCO on the road again! Summer came and went, and the autumn road trip for the INTERACT project CAPISCO started on the 15th September. This time we decided to start from Finland, from the Kevo Subarctic Research Institute. We flew to Kiruna (Sweden), got into our rented Hyundai and started the 670km drive towards northern Finland. The drive was long and mostly dark, but just before Sodankylä the sky was suddenly lighted up by spectacular Northern lights. We had to stop and admire them for a while as they performed their light green wave-like dance in the sky. Refreshed by the amazing light show, we continued all the way to our destination and arrived there around 2:30 am. Yes, a little late (or early), but what wouldn’t you do for science. Day two started with some lab work. We prepared our temperature loggers to be set up on our transects for the winter and got our trapping equipment ready for the evening. The moth adults (winter and autumnal moths) fly late in the autumn to find their mates and lay their eggs. They are active during the dark hours, so we started our field sampling around 8 pm. 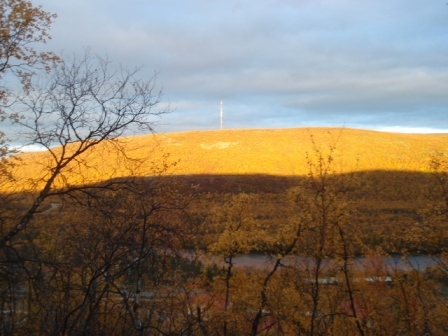 We were at our site a little bit early, but that was ok, since we got to admire a beautiful sunset lighting up the hill side that was covered in ruska (autumn coloured) trees. Sun set illuminating Ailigas fjäll covered in autumn coloured trees. 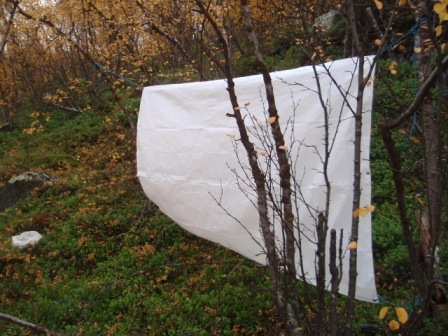 We sampled the adults at our transect in Utsjoki by 3 methods, one of which involved illuminating a white sheet in order to attract the moths. We knew that the moth densities at Utsjoki were really low based on the sampling from the summer tour. We were therefore not that surprised that we didn’t catch any adults although we saw 3 in flight. Nevertheless we decided to do some transect counting on our 20km drive back to the station and spotted at least 9 autumnal moth males. This time we got to the station before midnight and were happy to go straight to bed after a late dinner. Eagles, bears, new snow and even more dead trees! We had another couple of hundred kilometers to go from Nuorgam , (which is, by the way, European Union’s most northernmost town), so we left Finland behind and drove along the eastern Norwegian coast south towards Kirkenes and Svanhovd Research Station. The previously defoliated area seemed to extend all the way to Skippagurra and south from there: we saw dead forest patches almost all the way down the coast. The dieback of trees was even more pronounced near the town of Neiden, where a clear belt of brown, previously defoliated, mountain birch forests could be seen on the mountain slopes, whereas lower areas were overall a bit greener. This phenomenon is quite common in these northern areas, where heavier colder air accumulates at valley floors and occasionally is cold enough to kill the overwintering eggs of our study moth species. When continuing south on the winding roads (typical for Norwegian coasts in my opinion), we had to make a sudden stop when we saw a huge bird chased by a smaller one. We didn’t quite have the time to take out our binoculars to see the big bird in more detail, but we were quite sure it was a bird of prey chased by a crow. Another car stopped there too to look at the bird, and funnily enough, they were heading towards the Svanhovd station too, as we later saw the ornithologists and their car at the station. They were able to confirm that the bird was, in fact, a sea eagle! Neiden, +3 degrees Celcius, strong wind from the north and rain…what more can you say. We were also pretty sure there was some snow on the mountain tops that wasn’t there the day before when we drove by. Luckily we were prepared with layers and layers of warm clothing. We didn’t see any bears, but we did find larvae of both autumnal and winter moth, which warmed our minds and hearts at least a little bit. Our site was located just beside the nature reserve area with a huge palsa mire, Ferdesmyra, and once again the view from our site was quite stunning. 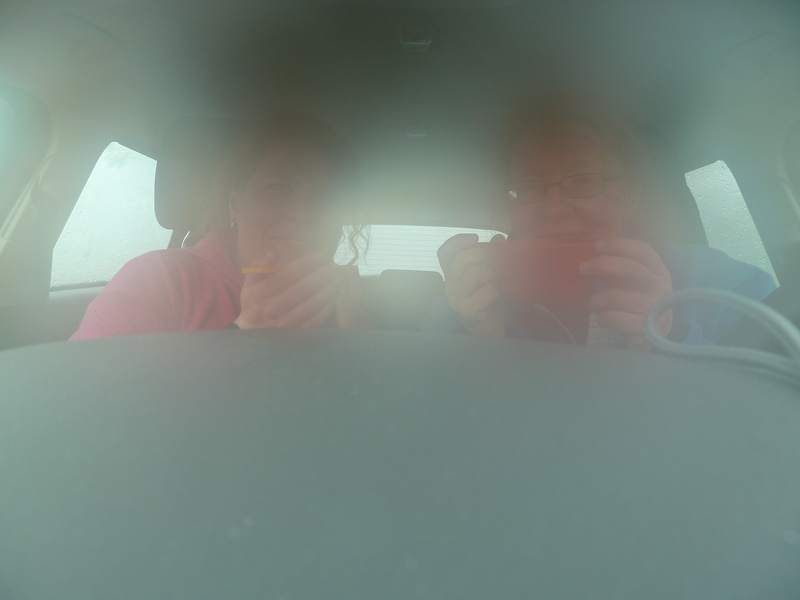 Still, we were quite happy when we finished sampling and got back to our rented car. Our clothes were soaking wet, our hands were freezing, but it didn’t matter anymore since we had survived our testing sampling sites, got good samples from them all and had hot coffee ready in our car to warm us up! After the freezing cold weather during sampling, warm coffee tasted so good! After sampling in Neiden, all that was left to do was to catch our plane in a couple of days at Kiruna. We spent the extra day visiting Abisko station one more time and this time the sun was shining! The larval outbreak was already a little visible from the brownish color on the mountain slopes and we started wondering, if the actual peak is going to be next year, which would result in even more profound defoliation. We will see if the winter is cold enough to kill the overwintering eggs this year or not. The next day we packed our stuff, packed our larvae too and headed for Kiruna airport. After a short discussion, and a few raised eyebrows (and a promise that our larvae would be treated nicely), the larvae were allowed to fly as pets in a heated cargo area in the airplane. A full blown summer greeted us at Arlanda airport an hour and a half later. Tea & Helena thank and sign out for the summer. We will be back for another trip in the autumn! 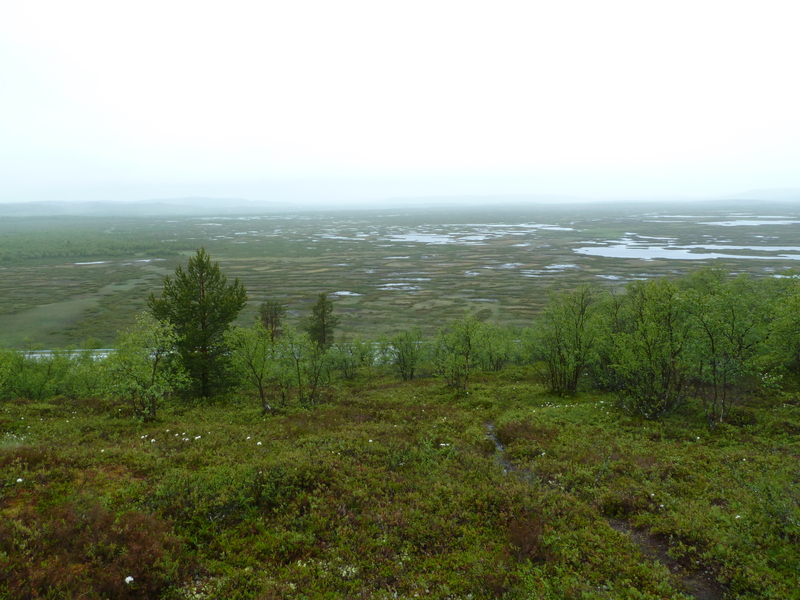 After a short midsummer break we drove 400km north to Kevo research station at Utsjoki in Finland. 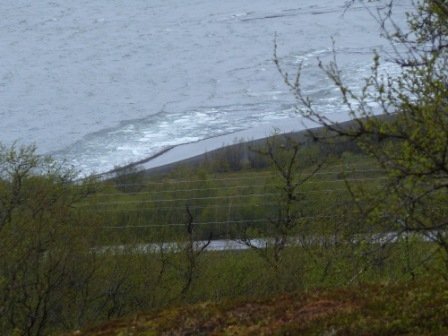 The rain from Norway caught up with us and the thunder and lightning that came with it hit the transmission tower near the station cutting us (and half of the people in Utsjoki village) off the internet. The lack of internet gave us more chance to talk with our colleagues, who told us, that, against expectations, the larval densities were really low around Kevo area. We noticed that out ourselves too when looking for suitable sampling sites despite the rainy weather. Luckily the bad weather didn’t last through the next day and we were able to collect our specimens from Utsjoki. The mosquitoes had so far been absent, but now we got to use our “mosquito jackets” when hiking up the steep slope we had picked to be our transect. For anyone heading to northern Fennoscandia for the summer, we would warmly recommend these jackets in addition to some powerful mosquito repellent. To our surprise we were able to find more larvae on the steep slope than we hoped for: our physical effort was not in vain! To anyone who’s wondering how fit we are, the rise was about 1 meter for each 2 meter advance uphill on the transect. Luckily the sauna in the evening washed away all the aches in our muscles and we even tested the water temperature at lake Kevojärvi by dipping in VERY quickly. The ninth day was another travel day. Heading towards the Norwegian coast and Svanhovd (BioForsk) research station, we decided to make an extra stop at Nuorgam, where the first and latest winter moth (Operophtera brumata) outbreak in Finland occurred a couple of years ago. Almost all of the mountain birches looked dead and only a couple of trees here and there had green leaves. We didn’t expect to find any larvae there, but we decided to try to sample there anyway. We got very lucky again finding both autumnal moth (Epirrita autumnata) and winter moth larvae. The view over the whole landscape with dead mountain birches was spectacular, and made us wonder about the overall consequences of defoliation this magnitude on the ecosystem. We arrived at Kiruna around 1 pm and headed straight to the car rental desk where we had reserved a car for our trip. I think I already smelled the birches and the sight of the fjälls and mountains made me smile. This is what I have been waiting for all spring. I guess it’s true what they say, that you can lose your heart to Lapland. My smile got even bigger when we arrived at Abisko research station and I saw several autumnal moth (Epirrita autumnata) larvae on the mountain birches outside the station. We have apparently chosen a proper time for our studies as it looked like an outbreak of our study species. The rain and cold didn’t stop us the next day as we climbed up the side of the downhill skiing slope to count larval densities of both autumnal and winter moths (Operophtera brumata) and to collect specimens, and the view was definitely worth the frozen fingers. The rain continued as we drove through to Norway and headed for our next site at Gratangen. There we also found larvae of a third geometrid species, scarce umber moth (Agriopis aurantiaria), that has been spreading along the northern Norwegian coast. The amazing mountain region of Norway took our thoughts away from the wet shoes and socks, but it was still nice to see the sky clear up when we approached the Finnish border at Kilpisjärvi. 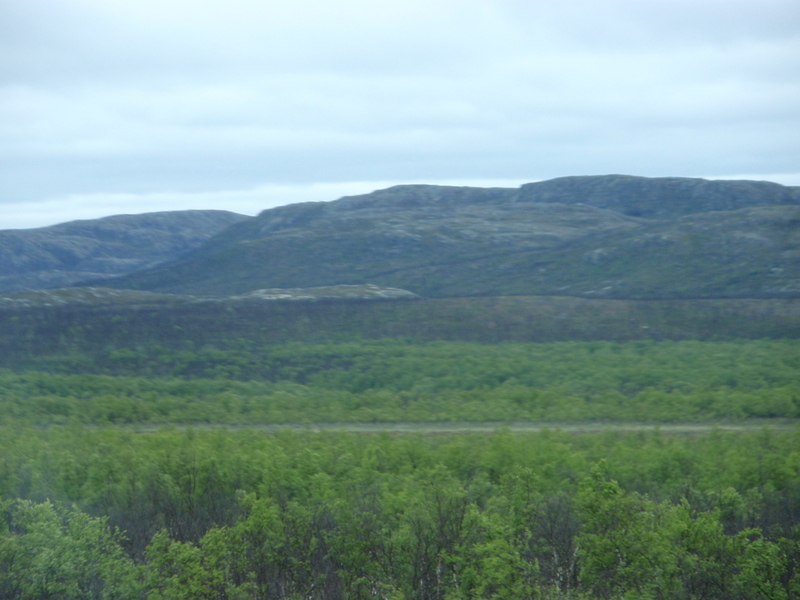 The defoliation on the Norwegian side was well known also by the local people at Kilpisjärvi. They were very helpful in showing where they had seen dead trees and seemed to be quite concerned when told that we had found larvae near the town. There were actually quite many larvae at Kilpisjärvi, and we had no trouble finding a suitable sampling site. 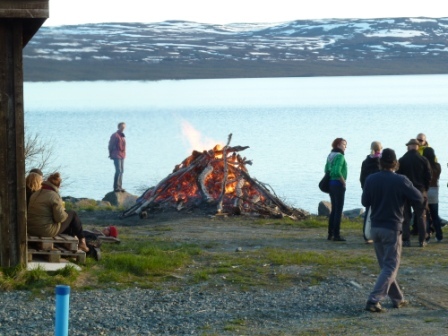 After sampling in a nice weather, for a change, we were free to enjoy the midnight sun and celebrate the midsummer. A new blog by CAPISCO team members Tea Ammunét and Helena Bylund will start here soon.